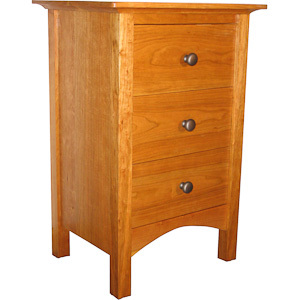 The Boothbay Curved Night Stand like our living room end tables brings a simple elegance of straight sides and gently tapered legs. The top has a curved front to match the front frame and a coved machined finish around the edge revealing a thin delicate edge. The bottom shelf also has a curved front lip to match the contour of the top. The shelf is spaced three inches from the bottom to easily vacuum underneath. Like many of my other models a three drawer model is available or a piece that has one drawer and a door covering the shelf. Both options are the same price.